Understand dance as a cultural practice that reflects and impacts local communities and global cultures. Develop and practice analytic, evaluative, and contextual skills requisite to critical thinking, kinesthetic understanding, and personal growth. Develop and practice skills in rhythmic, movement and compositional analysis. Develop effective communication and research skills to promote and articulate a deeper understanding of dance practice and theory. Engage in personal assessment and reflective practices that encourage self-directed learning. Understand how basic principles of dance science and teaching methodologies can be applied to technical and aesthetic development. Recognize and expand creative, artistic, and intellectual potentials. The Dance Major curriculum offers an in-depth study of dance as an art form and cultural practice. Students are given the opportunity to explore dance from several analytical and methodological frameworks: technical, creative, historical, cultural, aesthetic, pedagogical and scientific, resulting in a rigorous balance between creative work and academic study. Applicants who meet the following requirements are accepted during autumn, winter, spring and summer quarters on a rolling basis. Successful completion of five credits in any of the required core courses for the major. Be registered in or have successfully completed at least one technique course. 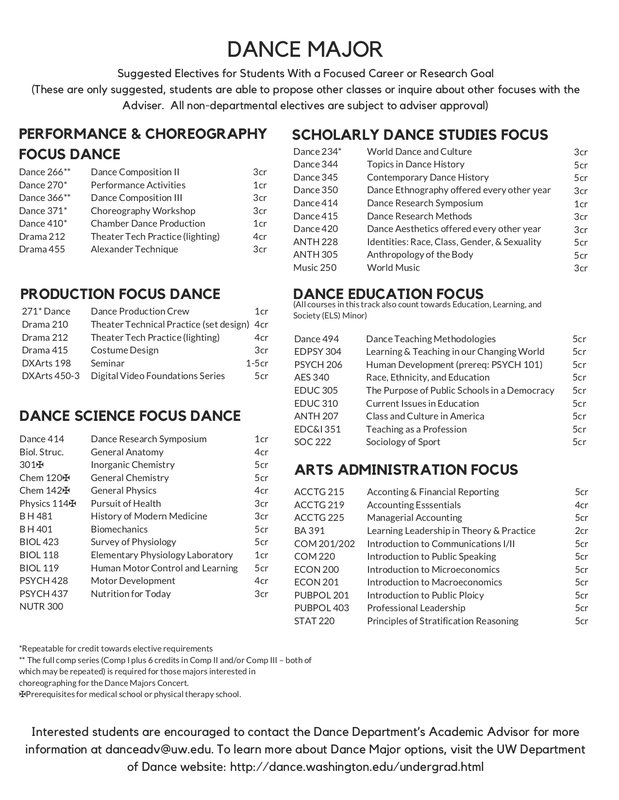 Electives in the Dance Major may be choosen from a list provided by the adviser or students may work the adviser to create a unique list based on career goals and focus. See page below or advisor for more details. 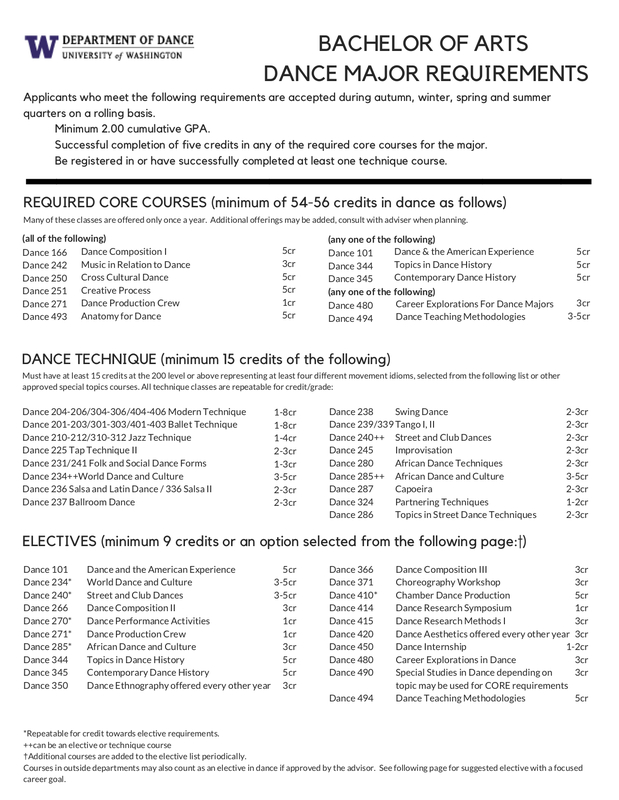 A number of the courses required in the Dance Major are offered every other year. Consequently, a student should anticipate a minimum of two years to complete all coursework for the major. From his/her first quarter as a major, a student should work carefully with the Academic Advisor in order to pursue course work in a progression that will guarantee completion of the major in four years. See attachments below for further details on the Dance Major Requirements.